Do you ever get days where the only thing that you absolutely desire to do it bake? You look through a classic Martha Stewart recipe book and dog-ear every other page because just about everything sounds so delightful to make. 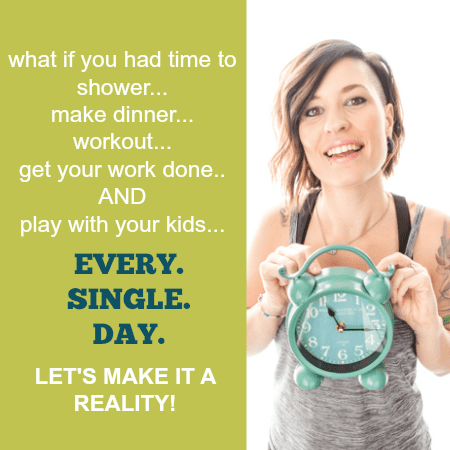 The idea of doing anything else just sounds absurd. The biggest problem you continue to run into is the fact that you would have to make a trip to the store for at least one necessary item each recipe calls for. Something like that would require putting on a real bra and some pants, and some days my friends, that’s just not in the cards. So just flipping through this holiday edition of a Martha book, and I came across a recipe that sounded delicious. 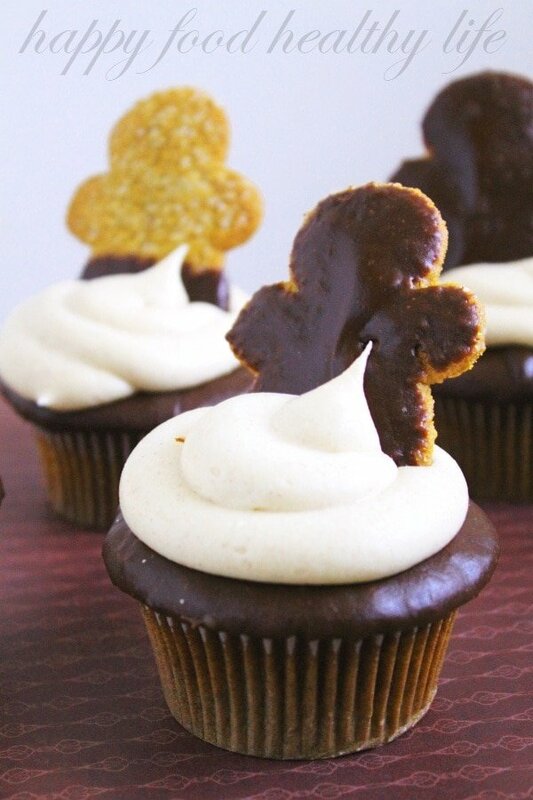 Gingerbread cupcakes. I had never made anything gingerbready. No cookies, no bread, no cake, and certainly not a cupcake. Knowing it wasn’t going to happen though, since I surely would not have all the ingredients, I slowly began turning the page. As I was turning, I was scanning the recipe quickly. Ah! Scan real quick a second time… I had everything! And within minutes, I was up and ready to go. Now let me tell you how happy I am about having made these delightful cupcakes. This has been a very stressful week for my family. My boy has been struggling with his asthma and my honey has been swamped at work with a ton of holiday shipments. I’m not one to call someone else out, but said Honey may have come right home after a particularly stressful day of work this week, walked right into the kitchen, grabbed a cupcake, and just started nomming. Yup, that happened. Nothing wrong with that – I’m just glad I was able to provide such comfort. On top of the comfort these cupcakes provide to all those who will nom them, these cupcakes just taste like Christmas. Their flavor is warm and it brings you to your childhood memories. You remember sipping hot cocoa after playing in the snow. You remember hanging homemade macaroni ornaments on the Christmas tree. You are taken right into the holiday season with the first bite. It’s almost December 1st, and I’ve just made my first Christmas-themed recipe of the year. I’m so excited for you to try this cupcake. I know there are a few steps, but I promise you that each one of them is worth it in the end. That first bite will confirm that all your hard work has paid off. I hope you have all the ingredients for these cupcakes in your cupboards right now, so you can jump up and get started. 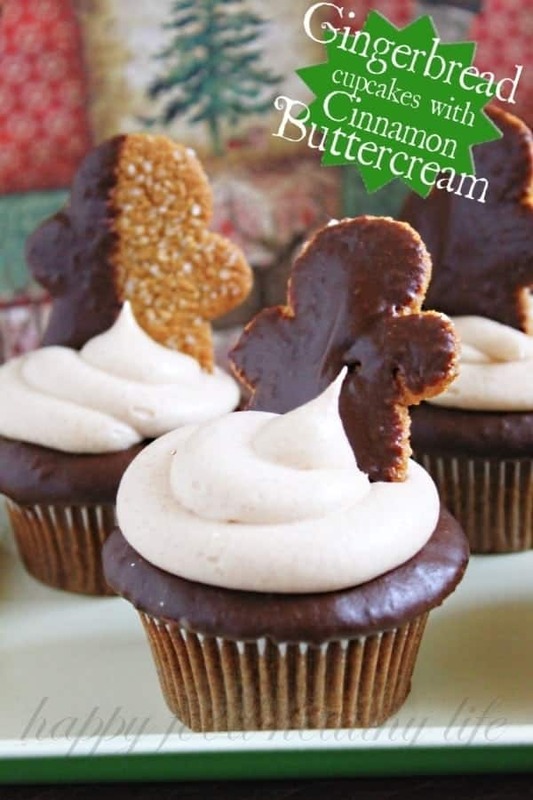 At least start on the cupcakes – you can get the buttercream going a little later if you need to run to the store. It’ll be worth it! Preheat oven to 350 degrees F. Line 18 cups of two muffin-tins with paper liners and set aside. In a bowl, combine the boiling water and baking soda; set aside. In a large bowl, sift together flour, baking powder, ground spices, and salt; set aside. Fill each prepared muffin cup three-quarters full, dividing batter evenly. Bake cupcakes until a cake tester inserted in centers comes out clean, about 30 minutes. Transfer tins to a wire rack to cool a few minutes, then remove cupcakes from tins, and let cool completely on rack. 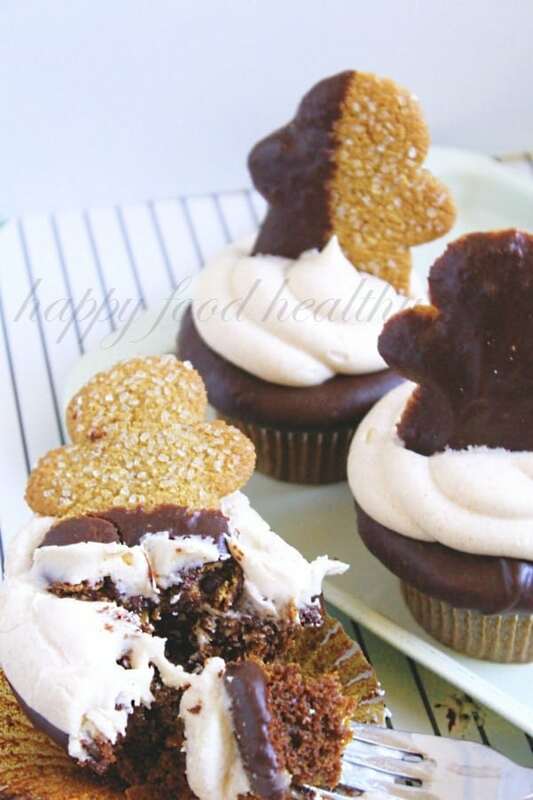 Working quickly, dip tops of cupcakes into chocolate glaze (recipe below). Let glaze set, about 20 minutes, before decorating with piped cinnamon buttercream (recipe below). In a heatproof bowl set over a pan of simmering water, combine chocolate, heavy cream, and butter. Let mixture melt slowly, stirring occasionally. Use immediately, or cover, and keep warm over simmering water until ready to use. Cream the butter with a mixer. Add 1.5 cups confectioner’s sugar, 1/2 cup at a time, blending well with each addition (mixture may be dry and crumbly). Add 3 tablespoons milk, cinnamon, and vanilla and blend. Blend in remaining confectioner’s sugar. Add more milk (about 3 tablespoons) until desired consistency is reached. Add more milk to thin and more sugar to thicken. Pipe on completely cooled and filled cupcakes. What was your 1st Christmas-related recipe made this year (or what will it be)? These look soooo good! Great pictures by the way 🙂 I haven't baked anything yet…trying to finish this semester up! Thanks Ashli – Your semester is almost over and then you can get your bake on!